The Palestinian-Israeli Conflict is quickly approaching its one hundredth year. It is a conflict of both regional and international importance involving Israel, the Palestinians, Syria, Lebanon, Jordan, Egypt, Iraq, the United States, the nations of the Arabian Peninsula, and the European Union. Since Israel’s independence in 1948, the Palestinian-Israeli conflict has involved Israel’s Arab neighbors on six separate occasions: the 1948 Arab-Israeli War, the 1956 Suez Crisis, the 1967 Arab-Israeli War, the 1973 Arab-Israeli War, the 1975-1990 Lebanese Civil War, and 2006 Lebanon War. There have been additional conflicts directly between Israelis and Palestinians including the First Intifada (1987-1991), the Second Intifada (2000-2005), and escalations in Gaza in 2008, 2012, and 2014. Churches for Middle East Peace (CMEP) believes working towards a just and lasting solution to the Palestinian-Israeli conflict would not only serve the cause of peace and justice in the Holy Land but also promote peace in the broader Middle East region in general. For Israelis, a peace agreement must include the following components: recognition of the right to exist from the broader Arab world, agreement on strategically defensible borders for Israel, the reestablishment of a vibrant Jewish community in the Old City of Jerusalem, and an end to the threats of suicide bombings and rocket attacks. 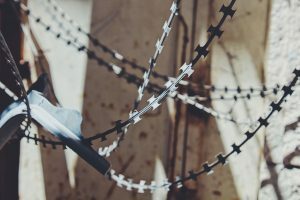 For Palestinians, a negotiated settlement must address the status of displaced refugees, ensure access to Christian and Muslim Holy Sites in Jerusalem, bring about the evacuation of Israeli settlements in East Jerusalem and the West Bank, provide for the dismantling of the separation barrier, and create a fully sovereign Palestinian state. 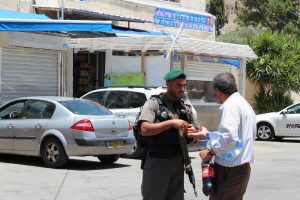 To address all of these concerns, CMEP pursues a just and durable resolution of the Israeli-Palestinian crisis in which Israelis and Palestinians realize the vision of a just peace, which illuminates human dignity and cultivates thriving relationships. CMEP would support a negotiated two-state solution to the Israeli-Palestinian conflict that includes an end to the violence, security for all peoples, an end to the Israeli occupation of Palestinian lands, the establishment of a viable and contiguous Palestinian state, and an agreement on Jerusalem that allows the city to be shared by the two peoples and three faiths. CMEP believes that working towards a just and lasting solution to the Palestinian-Israeli conflict would also promote peace in the broader Middle East by resolving grievances of those who exploit this conflict to serve their own ideological motives (see CMEP policy guidelines). Israel: Comprising 78 percent of the historic Palestine, Israel became independent in 1948. Since then, Israel has been at war six times with its neighbors and has had many additional conflicts directly with Palestinians within the occupied Palestinian territories of East Jerusalem, the West Bank, and Gaza. Correspondence between Sir Henry McMahon, British High Commission of Egypt, and Sherif Hussein ibn Ali of Mecca in which the British agree to recognize the Sherif’s claims to an Arab state consisting of Mesopotamia, the Arabian Peninsula, and Syria east of Damascus-Homs-Aleppo line. Secret agreement among British, French, and Russians to partition the Ottoman Empire after World War I. Designates some areas under direct European control while creating larger spheres of influence in the region. Palestine is designated as an area under joint British-French-Russian administration. An agreement between Emir Feisal ibn Hussein of Mecca and Chaim Weizman, President of the World Zionist Organization to encourage Jewish immigration to Palestine as well as to provide safeguards for the rights of the indigenous community. This agreement was conditioned upon Britain and France upholding their promise to establish an independent Arab state in Syria. International agreement by the United Nations to terminate the British Mandate of Palestine and establishes a plan for partitioning Palestine between a Jewish and an Arab state. Jerusalem is set aside as an international city. International agreement creating a Conciliatory Commission consisting of France, Turkey, and the United States for the purposes of coordination with local authorities in preparation of partition. International agreement calling on Israel to withdraw from all territories occupied during the Six Day War. Agreement reached between Egyptian President Anwar Sadat and Israeli Prime Minister Menachem Begin setting out parameters for an Israeli withdraw from the occupied Palestinian territories as part of a general Egyptian-Israeli peace agreement. A treaty reached between Egyptian President Anwar Sadat and Israeli Prime Minister Menachem Begin stipulating a staged withdraw of Israeli forces from the Sinai Peninsula and complete normalization of relations between Egypt and Israel. An agreement establishing formal mutual recognition between the government of Israel and the P.L.O. Israel commits to a five-year transitional period for withdrawing from Gaza and Jericho. A Treaty reached between Jordanian Prime Minister Abdul Salam Majali and Israeli Prime Minister Yitzhak Rabin establishing the international border between Israel and Jordan as well as providing for complete normalization of relations between the two countries. Agreement reached at Oslo between the government of Israel and the P.L.O to establish an elected Palestinian Interim Self-Government Authority (PA) and to begin the process of transferring governing authority in the West Bank to the PA. 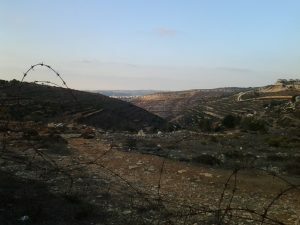 The PA obtains complete sovereignty over Zone A and Israel maintains complete sovereignty over Zone C. Zone B is administered by the PA while Israeli defense forces provide security. An interactive map showing Areas A, B, and C of the West Bank and Gaza Strip as well as the proposed Palestinian access roads joining them. An interactive map showing the division of Hebron between H1 and H2 zones. An interactive map of the West Bank showing the Israeli peace proposal at the Camp David Summit. An interactive map of the West Bank showing the Palestinian peace proposal at the Taba Summit. An interactive map of the West Bank showing the Israeli peace proposal at the Annapolis Process. An interactive map of the West Bank showing the Palestinian peace proposal at the Annapolis Process.